The program committee at the Black Gold Quilt Patch (Leduc guild) did a Tin Box Exchange a few years ago. I did one set, we had 2 groups at the same time. After all the boxes were done with 6 blocks we drew names to see who won each of the boxes. I won the Spring box. I am kind of thinking it might be nice to get a table runner done in time for spring. I did the Tree block. I have a top done now. 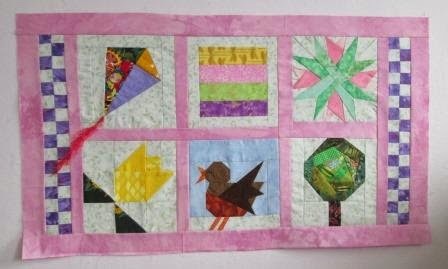 We will see if I can get it quilted and bound before Easter.